A little while ago I found the OWASP Juice Shop, and thoroughly enjoyed stumbling my way through its various challenges. The Juice Shop page itself can explain what it's about better than I need to here, but anybody looking for a stepping stone into the strange and mystical world of security testing, or even just web application testing in general, would be well-advised to check it out. After sharing it with my team at work, I wrote a guide to help them progress through various challenges at their own pace, without feeling too lost. While writing that, I ended up including snippets of Python code I was running from the REPL to demonstrate, and thought "...hey, I could probably automate this whole thing!" This blog is the result, and the code for the impatient ones is here. This blog and the linked repository were written against version 2.18 of the Juice Shop - naturally, by the time I got around to writing this, there's been an update that added a new challenge which I haven't had a chance to really look at yet. Something to do after I finish writing this! Anyway, below is the full list of challenges along with some (hopefully) useful explanations for how I figured them out initially. SPOILER WARNING: everything below here should only be read if you've completed as much as you can of the Juice Shop. Grab a copy of the Juice Shop from the link above. For the remainder of this blog I'll be assuming it lives at http://localhost:3000. Take a look at the OWASP Top Ten Project for areas to consider. Some familiarity with your browser's development tools. Create a user account in the Juice Shop(Login > Register Now!). It doesn't have to be a real email address, but we'll want to log in as somebody to poke around initially, and we don't know how to hack in to anybody else's account yet. Find the carefully hidden 'Score Board' page. So opening http://localhost:3000/#/score-board completes this challenge. The score board helpfully lists all the available flags, and at the end of the list, a Continue code that can be used to restore our progress. This updates with every new flag awarded - it's worth copying regularly, particularly if you're trying to inject data into the Juice Shop as you may mistakenly crash the whole thing! Provoke an error that is not very gracefully handled. XSS Tier 1: Perform a reflected XSS attack with <script>alert("XSS1")</script>. OK, things are heating up. If you're unfamiliar with Cross-site scripting(XSS) attacks, they're used by attackers to execute code in a victim's browser. A reflected XSS attack means the malicious payload is coming from the victim's request, somehow. If we copy the payload and paste it into the Search bar of the Juice Shop, we'll get a nasty little pop-up and a lovely little challenge complete notification, but what actually happened? This means, if the Juice Shop were a live site, some evildoer could send some innocent soul a link to the search page, with the payload set to some kind of nasty script, and it'll execute in their browser. Get rid of all 5-star customer feedback. There's a number of ways you can achieve this, but the first method I stumbled on was deleting it directly from the administration panel(accessing this is a later challenge...). As it turns out, any logged in user can accomplish this - a lesson in making sure your admin functions are actually limited to admin users! Following this link opens a legal.md file, which is indeed boring, but where it is interests us: http://localhost:3000/ftp/legal.md?md_debug=true. So far, we haven't seen any links to that ftp directory. If we open http://localhost:3000/ftp directly, we get a list of other files, one of which is acquisitions.md - grab that to solve this challenge. Some of the other files in this directory are protected, but don't worry, we'll be back. Access the administration section of the store. I randomly guessed this was located at http://localhost:3000/#/administration. We could have used something like the Forced Browse ZAP extension(a plugin based on DirBuster) to reveal it though. Give a devastating zero-star feedback to the store. We can provide feedback through the Contact Us section of the store. It automatically populates our email address(or sets it to anonymous if we're not logged in), but requires a comment and a rating before we can submit. However, this check is flawed - by entering a comment, selecting a single star, then selecting that same star again to remove the rating, we're able to submit a zero-star feedback and claim this challenge. Log in with the administrator's user account. "sql":"SELECT * FROM Users WHERE email = 'test'' AND password = '0cc175b9c0f1b6a831c399e269772661'"
It's the full query that tries to execute when we login, but apparently it doesn't like our apostrophe. So, breaking out the SQL injection bag of tricks(or running a tool like SQLmap), we can try manipulating the query by logging in as ' OR 1=1-- with any old password. The apostrophe closes the WHERE email = condition early, at which point we inject an OR to check if the number one is equal to the number one. It is, shockingly, and the rest of the query becomes a comment thanks to the double dashes, so now the query executed should read SELECT * FROM USERS WHERE EMAIL = '' OR 1=1--... and we're logged in as the administrator. It seems like the site accepted the first result from that SELECT * FROM USERS, and user ID #1 just happens to be the admin. Fantastic. Log in with the administrator's user credentials without previously changing them or applying SQL Injection. That's not the plaintext password, it's the hash stored in the database. Unfortunately, it's a very weak password, and Googling it reveals it's been cracked long ago. Logging in with admin@juice-sh.op with password admin123 awards this challenge. Still logged in as admin, let's open our dev tools to the Network tab, then click on 'My Basket'. 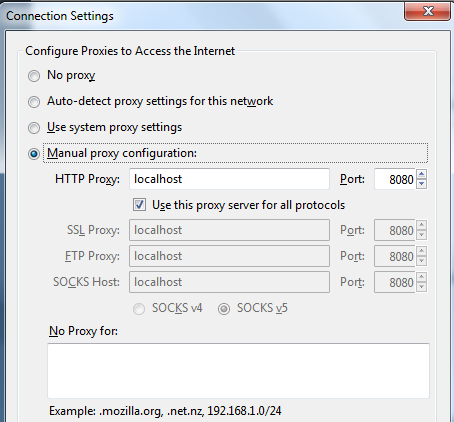 We can see a call to '1', the full path of which is http://localhost:3000/rest/basket/1. Trying to open this URL without being logged in returns a 401 Unauthorized response, but we can use Firefox's handy 'Edit and resend' functionality by right-clicking this request and selecting it. Changing the target url to http://localhost:3000/rest/basket/2, keeping our existing auth headers and so on, completes this challenge. Access a salesman's forgotten backup file. Let's hop back into the /ftp folder. coupons_2013.md.bak certainly sounds like the kind of thing somebody in Sales would be interested in, but trying to access it throws an error - only .md and .pdf files are allowed. When we first encountered this directory, the legal.md file also had a parameter provided - ?md_debug=true. Adding this to the file doesn't help much, but by changing 'true' to '.md', and accessing http://localhost:3000/ftp/coupons_2013.md.bak?md_debug=.md we're able to open this file and complete the challenge. The contents are a list of coupons... that'll come in handy later. Inform the shop about an algorithm or library it should definitely not use the way it does. This challenge requires us to grab the developer's backup file in /ftp, which we haven't solved yet. In the interest of ticking off challenges as we go, let's just submit a comment saying "z85 0.0", and we can explain it later. Order the Christmas special offer of 2014. Right at the end, we can see deletedAt IS NULL - the database must perform some kind of soft delete. If we can truncate the query before it reaches that filter, maybe we can find our special. Looking at the first occurence of our test string, we see it's in the middle of a wildcard search. Let's try searching for christmas%25'))-- - the %25 is a url-encoded percentage sign, the apostrophe breaks the query, the double brackets close the opening brackets after WHERE cleanly, and the double dash comments out the rest of the line. Popping that string into the search bar returns only "Christmas Super-Surprise-Box (2014 Edition)" - sounds like our jam. Let's pop that in our basket and checkout to complete this challenge. Log in with Jim's user account. From the same method we used to retrieve the administrator's password earlier, we can retrieve Jim's, and his password is also weak enough to be available through a quick search. Log in with Bender's user account. Bender, however, is clever and apparently chose a strong password. We've already broken the login form to bypass the need for passwords entirely, though, so let's just change our injection string from ' OR 1=1-- to bender@juice-sh.op'-- - this changes the query to SELECT * FROM USERS WHERE email='bender@juice-sh.op', and accepts whatever password we provide since it's unchecked. XSS Tier 2: Perform a persisted XSS attack with <script>alert("XSS2")</script> bypassing a client-side security mechanism. Challenge complete. Now anybody who views the administration panel, which displays user email addresses, gets hit by our XSS payload. XSS Tier 3: Perform a persisted XSS attack with <script>alert("XSS3")</script> without using the frontend application at all. ...and the response is... [...]"status":"success"[...] Challenge solved. Might want to change that back to something less annoying if you're still exploring, otherwise you'll see it on every search page. Challenge complete, user table dumped. Post some feedback in another users name. Edit and resend to the rescue again. Editing our payload to a different(valid) UserId solves this challenge. Place an order that makes you rich. Browsing to our basket reveals that the Juice Shop has accepted our order, and checking out grants us all the imaginary money we need for now. Access a developer's forgotten backup file. Back to /ftp we go. We can see a package.json.bak in here, but our earlier trick with the md_debug flag isn't working. Luckily we have other tricks up our sleeves, such as Null byte injection. Appending %2500.md(%25 is a URL encoded percentage sign, so we're asking for %00.md) might get us past the filter, only to hopefully vanish at the filesystem layer and retrieve the actual file instead. Opening localhost:3000/ftp/package.json.bak%2500.md in our browser does indeed allow us to download this file, solving this challenge and giving us a lot more information on how the site was built. Change the href of the link within the O-Saft product description into http://kimminich.de. The same cUrl trick we used to overwrite a product description for XSS3 will work here, just target the O-Saft product ID and PUT the updated description instead. There's a couple of options here now that we have the developer's package.json to peruse, but considering the havoc we've been wreaking with SQLi, it seems only fair to submit "sequelize 1.7" as our vulnerable library. Find the hidden easter egg. /ftp folder again, this time grab the eastere.gg file using a null byte injection, same as the developer backup. Travel back in time to the golden era of web design. Awesome. Challenge complete, but the satisfaction pales in comparison to our fancy new theme. Upload a file larger than 100 kB. # Prepare multipart request - whatever as filename, trash.txt as content. This solves the next challenge also. Upload a file that has no .pdf extension. Log in with Bjoern's user account without previously changing his password, applying SQL Injection, or hacking his Google account. Which prints out..."incognitjoeb@gmail.com"? Oh, that's not good, the account creation process is setting default passwords as the base64-encoded email address. Yep, you guessed it, base64-encode Bjoern's email address to find his password, no OAuth wizardry required. XSS Tier 4: Perform a persisted XSS attack with <script>alert("XSS4")</script> bypassing a server-side security mechanism. 1.4.3: invokes itself recursively until the markup stops changing to guard against this issue. Bump to htmlparser2 version 3.7.x. Interesting, the version in use has an unpatched bug, and that entry links us to an example of how to exploit. Let's go ahead and try putting some bait tags in the middle of our payload tags, so they'll be removed and hopefully our reign of terror can continue. Entering <</b>script>alert("XSS4")<</b>/script> as a feedback comment and submitting wins us this challenge. Guess not. Wherever you go, it should be the next challenge because we're done here. Change Bender's password into slurmCl4ssic without using SQL Injection. This returns a 401 unauthorized, with the message 'Current password is not correct', but we were kind of expecting that. Let's put this endpoint through its paces, and drop the current=abcde bit altogether to see what happens...oops. Looks like it worked, if the current parameter is excluded then the new and repeat are instantly accepted, putting all users at risk of a CSRF attack that could change their passwords. Nasty - by following a search link sent by some villain, they've changed our password. 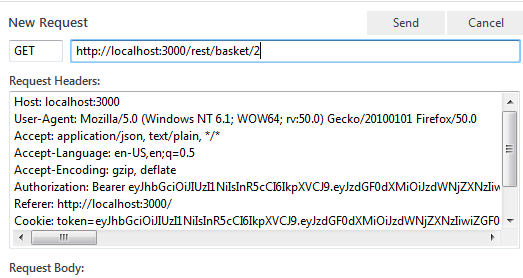 Since we don't get logged out by this activity, we might not even notice - this extremely crude payload returns a blank search panel since it breaks the SQL search, which is pretty much the only clue a normal user would have that something was amiss. I really, really like this challenge. Apply some advanced cryptanalysis to find the real easter egg. Read the eastere.gg file and play this one out for yourself - don't be afraid, it's not as daunting as you might think. There's two rounds of encoding at play, is all I'll say here - you can check the automated repository for the solution if you really want, it's in the misc.py file. Retrieve the language file that never made it into production. Watching the network traffic whenever we load a page gives us the location of the language files - http://localhost:3000/i18n/en.json gives us all the strings in the juice shop in English, for example. See the automated repo for the source file I used to bruteforce my way through this challenge - there's a lot more language codes than I knew about! Exploit OAuth 2.0 to log in with the Chief Information Security Officer's user account. ...in fact, I solved this one accidentally, and it took me at least fifteen minutes to even figure out what had happened. So, let's start from the basics here - the login window. We've got an email field, a password field, a Log In button, a Google OAuth login button, and a link to "Register Now!". Oh, and a Remember Me checkbox, like every other login window... actually, let's see what that does. First let's log in with credentials we actually have. Now, take a look at your cookies, since that's how Remember Me functionality usually works... and yep, we have a cookie from the juice shop with an email key and our user's email address as the value. Browse around the site a bit, and pay attention to your headers - see that X-User-Email header? We didn't seem to have that before. Must be coming from our cookie! Let's log out and try to log in as ciso@juice-sh.op with an invalid password but Remember Me ticked. Doing this sets our cookie email value to the CISO, so our user email header is the CISO too, but that doesn't get us much further... until we remember this is an OAuth challenge, and log in using the OAuth mechanism... and boom, we're done! The solution in the automated repository might be cleaner to read, but the flaw here seems to be that the OAuth integration for login will accept the 'X-User-Email' header as gospel regardless of the account that just logged in, so this header combined with a 'valid' OAuth login(you can actually just set it to true in the payload sent to /login !) exposes the CISO's account. Forge a coupon code that gives you a discount of at least 80%. There we go - three characters for the month, two digits for the year, a dash and then the desired percentage off. It's Christmas time, so let's give ourselves a nice 99% off by z85 encoding 'DEC16-99', applying that coupon and checking out! Fake a continue code that solves only (the non-existent) challenge #99. Of course, this is also solved in the automated repo if you really want to spoil yourself, I won't judge. Well, yes I will, but I'll do it quietly. Hopefully you've learned a few tips and techniques to bring with you in your role as a tester or Skeletor or whoever you happen to be - after making it this far, you've earned whatever you want to do with the information. If you have any questions, comments or suggestions, hit me up on Twitter!